Associate Mental Health Counselor, Washington. Benyshek, D. (in press). The artist as shaman. ReVision, a Journal of Consciousness and Transformation, 32(2), 54-60. Benyshek, D. (2012). Art audience as shamanic community: How art meets psychological, social, and spiritual needs (Wang, Trans.). In G. Shuyun, W. Weibo & Q. Fang (Eds. ), Modern artists and shamanism (Vol. II of Encyclopedia of shamanism). Beijing: 商務印書館 (The Commercial Press). Benyshek, D. (2012). An Overview of Western Ideas regarding the Artist as Shaman (Wang, Trans.). In G. Shuyun, W. Weibo & Q. Fang (Eds. ), Modern artists and shamanism (Vol. II of Encyclopedia of shamanism). Beijing: 商務印書館 (The Commercial Press). and psi. Journal of Parapsychology, 76(1), 3-23. Pages 14-16 discuss psi experiences related to my art and related creative processes. Presentation at the 27th International Conference of the Society for the Study of Shamanism, Healing, and Transformation. Written with my son, Hans Janos Benyshek van Wyk. was founded in 1984 by Dr. Ruth-Inge Heinze to preserve and further the integrity of shamanism and share the latest insights in the field of alternative healing. Denita Benyshek's current research investigates the art audience as shamanic community. Denita will define shamanic community, examine how individual and societal needs are met through art, reframe attendance of art events as ritual, provide a brief overview of recent research on the healing power of art, and share personal stories. This presentation will enhance your ability to engage with art, find meaning, and achieve a state of mystical union and transcendence through art. When 82 year old anthropologist, Dr. Ruth-Inge Heinze, taught her last seminar on shamanism at Saybrook Graduate School, Denita Benyshek was among her fortunate students. Knowledge, conveyed through lectures and through a series of visions, revealed many similarities between shamans and artists. 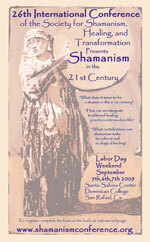 Using Dr. Heinze’s definition of a shaman, Denita will demonstrate how artists may qualify as shamans. The discussion is grounded in over three decades of experience as a professional artist, which provides autobiographical evidence of shamanic experiences during artistic creativity. 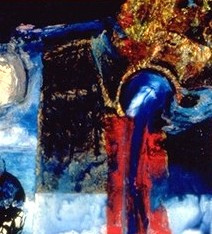 Research, from psychology, anthropology, sociology, creative studies, art history, and religious studies, is also considered towards constructing an interdisciplinary and multicultural theory of the artist as shaman. Topics will include calling, initiation, androgyny, shamanic journey, healing, integration, and an alternate, nonpathological, model of artistic creativity. I have gifts for you, brought from the frozen arctic, passionate Slavs, and animist farmers. Please enter my artwork. Stay for awhile. What do you find? In the light of your focused, extended gaze, you leave sensate reality and a trance develops that will take you to a visionary realm. Slow, breathe, open, and be receptive. You see images, textures, and colors merging with the images of your memories, the textures of your emotions, and the colors of your mind. 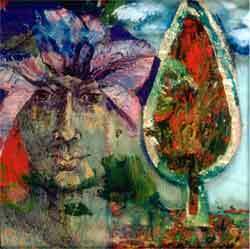 As you form relationship, between yourself and the art, you are engaged in a creative process. Waves of impressions arrive while the boundaries of self begin to disintegrate. Waves of color and light enter you to dance within. The dance is ancient and new, a troupe of plankton in the ocean, and a flickering trail winding through synapses. Follow that trail. Whatever you discover is gradually integrated into a changed you. Now, you are the work of art – a subtly yet definitely renewed self. Above: Download recent article about orientation table in Alpine Lakes Wilderness Society Newsletter, see page 2. Below: Download full color pdf image.